This document contains information on how Instructors can find and share a Blackboard Collaborate Recording in Illinois Compass 2g. 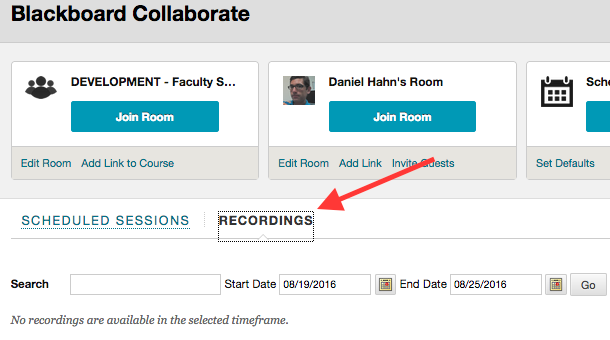 Blackboard Collaborate session recordings are found under Course Tools > Blackboard Collaborate > Recordings (or from a Content Area go to Tools > Blackboard Collaborate > Recordings). If no recordings are displaying adjust the Start Date and End Date to correspond to the dates when the recording took place. If you are still unable to find the recording it is possible that some users may not have logged out of the session. 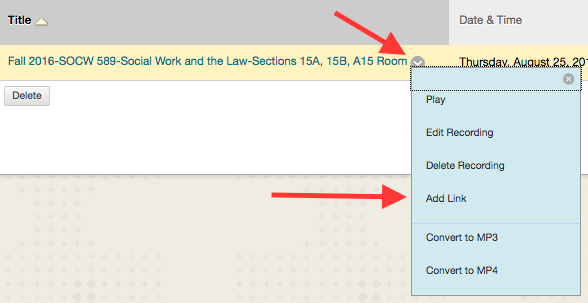 Log in to your Blackboard Collaborate session and remove any users still logged in (right click on the participant and select remove user) and then close Blackboard Collaborate.